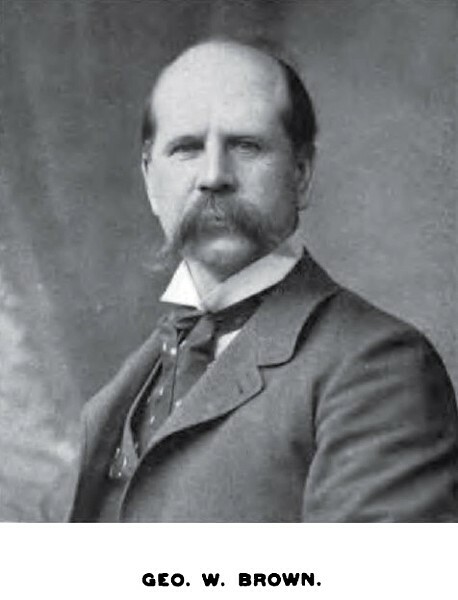 GEORGE W. BROWN, President and General Manager of the Belknap Motor Company of Portland, Me., was born in Brooklyn, N.Y., May 31, 1850, son of Captain Joseph K. and Mary K. (Chapman) Brown, the former a native of Topsham, Me., the latter of Damariscotta. Joseph K. Brown was born in 1819. He followed the sea for a livelihood, being Captain of the barque "Missouri," which was built at Newburyport, Mass. Captain Brown died, and was buried at sea in 1850, while on a voyage from New York to Sumatra. His wife, who is still living, is now seventy-three years of age. They were the parents of three children-Josie, Susie, and George W.
George W. Brown received his early education in the schools of Damariscotta, his mother having removed from Brooklyn after her husband's death, and returned with her little family to her old home. He subsequently attended Lincoln Academy at New Castle. In 1874, when he was twenty-four years of age, he went into the grocery business in Damariscotta, continuing in this some fourteen years; and, some years later removing to Portland, he engaged in the sale of water motors. From handling these goods Mr. Brown became interested in their mechanism, and invented a combined water motor and mill, which was a grand success. He afterward added to this mill an electric motor, and later combined water motors and dynamos. The sale of these machines led to the handling of other electric contrivances, which were all made, by contractor. In 1888 a stock company was formed, known as the Belknap Water Motor Company. A large amount of advertising was done, and the company secured orders for its inventions through all parts of the United States. In 1890 the Belknap Motor Company, which includes some of the leading citizens of Portland, was organized, purchasing all the right, title, and interest of the Belknap Water Motor Company, whose stock had advanced in value from ten dollars to fifty dollars per share. Up to 1892 all the products of the corporation were manufactured by outside companies, the electrical machines being made by the Giant Motor Company. On the failure of that company, being unable to obtain the products required to fill their orders, the Belknap Company was obliged to take up the manufacturing business, which they did in March, 1892, taking the building that the Giant Company had formerly occupied. At the end of a year the business had so increased that they were obliged to double their capacity; and in 1894 they enlarged it one-third more, adding fifty feet to their three-story building, making a factory one hundred and ten feet long and three stories high, covering a floor surface of about twelve thousand feet. The products of this company have been shipped to nearly every country on the globe, and are known as the most efficient and desirable machines in the market, the name Belknap having become a synonym for excellence. Their motors range from one-eighth horsepower to one hundred and fifty horse-power, their dynamos from five to two thousand lights in capacity, and generators from six and a half to one hundred and twenty-five kilowatts' capacity. They are built on both the multi-polar and the bipolar principle, and are of the direct current variety, alternating apparatus never having been a part of their manufacture. This company has supplied hundreds of motors and dynamos to buildings in Portland; and the Maine State College, the Delaware College, the Kansas. State Agricultural College, the United States Marine Hospital, and the Vermont State Insane Asylum are using their electrical enginery. The installation of isolated lighting plants has become an important part of the company's business, particularly marine work; and the steamers "Bay State" and "Portland" of the Portland and Boston line, and the "St. Croix" of the International Steamship Company and "Cottage City" and "Manhattan" of the New York line, are pointed at with pride as particularly fine electrical installations. Mr. Brown is the inventor of the composite woven wire and graphite brush, the cyclone coffee-mill, and the combined water motor and dynamo; and he has made improvements on the water motors. He is a man of great inventive talent, possessing at the same time remarkable business qualifications, and has risen to his present position through his own efforts alone, pushing by his energy and sagacity the affairs of the company of which he is President and General Manager to a plane of prosperity and eminence. Mr. Brown married Miss Emma Hatch, of Damariscotta, Me., daughter of Briggs and Eliza (Nubert) Hatch. In politics Mr. Brown is a Republican. He and his wife are members of the Congregational church at Woodford's. They have a pretty home at Deering Centre, where Mr. Brown finds rest and quiet after the cares and activities of business hours in the city.